Well, I don't know what this means for Doom Slayer. From the sounds of it, Sakurai was given a list of what he was allowed to do rather than Nintendo outright saying what exact 5 he must do. So..... how's Nintendo's relations with Bethesda lately? let's think of this from Nintendo's point of view as well, if they're gonna put in characters as DLC, they're gonna want to put in characters that have games coming out soon. Out of all the possible Bethesda reps, Doomguy has an upcoming game release in 2019 with Doom Eternal, and on the Switch as well! So it would make sense to select him for a possible DLC candidate considering that, as well as his contributions to gaming as a whole. Doom Eternal will be coming to the Switch. I don’t see how that’d hurt Doomguy. Remember that if Verge and Hitagi are to be believed, we’re getting a SE character and Steve, which means Nintendo wanted those characters, who are 3rd party. I totally see Nintendo bringing up the fact that Bethesda wants a character to Sakurai, and then Sakurai picks Doomguy due to his gaming legacy. This actually bodes extremely well for us. Which means the Switch trailer ending with the Doom Guy getting an envelope with the Smash logo has a better chance of happening. Well, as long as it's next year. How would he even get the letter? Actually, I’d imagine Doom Slayer finding something similar to the Slayer Testaments of 2016, but instead of his mark, it’s the Smash Cross. I even thought of a prophecy that basically says that Hell would banish Doom Slayer to the World of Smash Bros, where he’d fight them for eternity without him intruding in their plans for a hypothetical trailer. Same way he finds those Doom dolls. I only made an account here so i could share a post with ideas and talk about Doomguy as a potential Smash fighter. Think of it as a "megapost" that was meant to collect stuff related to the topic, be it why he should be in, how he could work or ways to work around his "red flags". It's not a perfect post, may have some mistakes, poor grammar or missing something because it was technically rushed. But it should have enough to make discussion more interesting. That blog post is gonna take me some time to get done. You mind telling who the Japanese Doom artist is? I really gotta know because it's not often I see Japanese fans of any game from the West. She also particidaped in a Megawad called Japanese Community Project. She?! Why does Japan get all of the best female gamers? I found this thread and thought "Heck, why not post that thing I made and see how people react to it?" Note that this is relatively unfinished until Doom Eternal comes out due to obvious reasons. The King of the FPS genre arrives, taking a break from terrorising the legions of DOOM to terrorise the fighters of Smash. Befitting of the fast-paced action and heavy focus on guns from his home series, the Doom Slayer (or simply Doomguy) is a fast, hard-hitting, projectile-based rush-down fighter utilising firearms and a few brutal melee attacks in his unique grab mechanics. Basically, a steroid-infused Mega Man who prefers to get up close and personal in enemies faces rather than keeping them away. All of Doomguy's main weapons run off of ammunition; Bullets (100), Shells (30), Rockets (10) and Cells (200). If Doomguy runs out of ammunition, attacks will either be replaced with the infinite ammo pistol or outright disabled. KO's reward small amounts of ammo, though a successful side-special can better refill his reserves. Doomguy is the ultimate glass cannon, receiving significantly higher damage than other fighters and can be launched more easily, necessitating a playstyle of constant dodging, jumping and moving (I.e. if you stand still, you're going to die). While small health pickups occasionally drop when Doomguy KOs an enemy fighter, his main method of recovering from attacks is via his grabs and throws. Based primarily on his Eternal incarnation, Doomguy also incorporates elements from his 2016 and other previous outings into his design and moveset. The idea of this moveset is to imagine it unhampered by a ratings board. I don't see any reason why Doomguy's arsenal would necessitate censoring; energy and explosive-based weapons are already excused, there won't be blood and gore produced to warrant worrying about the chainsaw (which already technically exists in the form of Corrin's sword) and his ballistic firearms (Combat Shotgun, Heavy Cannon, Chaingun, Super Shotgun) should look futuristic/fantastic enough to pass off as "unrealistic" (I mean, come on, how many double-barrel shotguns out there come with runic inscriptions on a barrel and twin blades attached to an extendable chain launcher?). Jab: Similar to Ryu/Ken, Doomguy's jabs change depending on the length of time that the attack button is held down for; tap-firing sees Doomguy firing his Combat Shotgun while holding down the fire button sees him shooting the Plasma Gun. Each weapon consumes 1 Shell and 1 Cell per shot respectively. If he is out of either ammunition, will fire his pistol and prepare a charged shot respectively. F-Tilt: Similar to Mega Man, all of Doomguy's forward tilt attacks behave identically to his jabs, allowing him to fire his weapon normally while closing in on a fleeing opponent. U-tilt: Fires a Triple Burst from the Shotgun (if tapped) or a Heat Blast from the Plasma Gun (if held) upwards. Consumes 3 Shells and 20 Cells respectively (alternatively, the latter could possibly behave as it did in 2016 by increasing in power as the Plasma Rifle is fired, while not consuming any Cells when used). If ammo is depleted, fires a shot from the pistol. D-tilt: Ducks and fires an Explosive Shot from the Combat Shotgun (if tapped) or a Stun Bomb from the Plasma Rifle (if held), the latter dealing no damage but momentarily disorients fighters. Consumes 2 Shells and 20 Cells respectively. If ammunition is depleted, fires a shot from the pistol. Additionally, if Doomguy is firing his weapon while moving backwards, he can continue firing in the same direction (a sorta 2-D interpretation of strafing. This allows him to create a barrier of sorts as he moves out of harm's way, However, this also means that players must keep an eye out for fighters he has turned his back towards, as he is completely exposed to their attacks should he not change direction in time. Always ensure that enemy fighters stay within his crosshairs. Dash Attack: Fires off a Charged Burst from the Combat Shotgun (if tapped) or a Heat Blast from the Plasma Rifle (if held), consuming 3 Shells and 20 Cells respectively. If ammo is depleted, fires a shot from the pistol. Forward Smash: Pulls out the Super Shotgun and fires both barrels in the direction he is facing, consuming 2 shells in the process. If ammo is depleted, fires a more powerful charged shot from the pistol. Up Smash: Pulls out the Chaingun with the Gatling Rotator modification, unleashing a quick upwards barrage. The amount of bullets fired by the Chaingun changes depending on the length of time the attack was charged (indicated by the barrel spinning progressively faster); a quick tilt-smash will fire off 10 bullets, while a max charge will fire off 25. If ammo is depleted, fires more powerful charged shot the pistol. Down Smash: Pulls out the Super Shotgun and fires one barrel in either direction. If ammo is depleted, fires a couple charged shots from the pistol. F-air: Identical to the F-tilt. D-air: Identical to D-tilt, but fires the grenade/stun bomb directly below him. B-air: Has none to speak of. Instead, he can continue firing in the same direction while moving back, as stated above. Has the same benefits of keeping the pressure up while moving out of harm's way, but means that Doomguy must keep an eye out to ensure that enemy fighters stay within the direction he's facing. Doomguy has a unique grab mechanic inspired by the Glory Kills from 2016 and Eternal. Essentially, after an enemy fighter has been damaged above a certain threshold (enough for them to be KO'd by any of Doomguy's throws), they will begin flashing in a light blue highlight, which turns an orange-red should the Doomguy be within grabbing distance. If the fighter is then throw-KO'd in this state by Doomguy, a shower of health pickups will be expelled from the area that the fighter was KO'd, gravitating towards Doomguy and healing a significant amount of damage (30-40%). If a fighter is not in this state and the throw was a successful KO, fewer health pickups will be rewarded, encouraging Doomguy to soften up his enemies before killing them (while giving attackers a chance to counterattack). Grab: Fires the Meathook from the Super Shotgun, dealing damage and pulling him towards his victim, which he then grabs by the jugular. Acts as a pseudo-tether that grabs fighters as opposed to ledges. Pummel: Repeatedly sucker punches his victim in the stomach with the Doom Blade. F-throw: Performs a meaty right blade-hook into his victim's face, sending them flying backwards. U-throw: Blade-uppercuts his victim into the stratosphere. D-throw: Slams his victim into the ground, burying them before stomping on their head to bounce them back up. B-throw: Sweeps his victim off their legs, grabbing them by their ankles and throwing them behind him. Neutral Special - Micro-Missiles: Pulls out the Heavy Cannon and fires a burst of 6 miniature missiles which home in on and explode on contact with opposing fighters. Deals significant damage with slight knockback should all 6 missiles connect, halting an advance or attack and allowing Doomguy to move in for the kill. Takes a short while to recharge and consumes 3 Bullets per missile. The attack is disabled if Doomguy has no ammo. Side Special - Chainsaw Charge: Pulls out The Great Communicator and dashes to the side, ramming the weapon into a fighter's guts. The fighter is held in place (alongside anything else caught in the Chainsaw's path), continually taking damage before being sent flying upwards at the end of the attack. Ammunition is also expelled from the fighter in high amounts, which scales depending on the number of fighters in the arena (1 fighter completely fills up Doomguys reserves if caught, 2 fighters fill up half each, etc.). Can strike and hold multiple fighters in one dash. Leaves Doomguy vulnerable for a short time should he not damage anyone. Up Special - Rocket Jump: Uses the Rocket Launcher to fire a rocket beneath him, dealing heavy damage to fighters and slight self-damage while using the explosive force to propel himself upwards. The height of the Rocket jump changes depending on Doomguy's upward velocity before the projectile detonates, increasing if Doomguy travelling upwards after a jump and decreasing while in freefall. Utilises the Remote Detonator to detonate the rocket if there is no surface immediately beneath him. Consumes 1 Rocket per shot. The attack is disabled if Doomguy has no ammo. Down-B - Ballista: Fires a powerful bolt in the direction he is facing, dealing significant damage to any fighter it hits with slight recoil pushing Doomguy back. When in midair, Doomguy fires the weapon at a downward angle in the direction he's facing (similar to Falcon Kick/Wizards Foot). The high recoil in midair can push Doomguy upwards in the opposite direction that the weapon was fired at. This "Gauss Jump", while not as powerful as a Rocket Jump, can provide a slight boost to an existing jump or assist with horizontal recovery. Consumes 20 Cells per shot. The attack is disabled if Doomguy has no ammo. Fires a Big ****ing Green shot from wherever Doomguy is currently standing at the direction he is facing. Plasma tendrils will lash out towards any onstage fighters, holding them in place as they are damaged. Upon impacting either a fighter, the stage or the blast zone, the shot violently explodes and all fighters connected via a tendril are launched. Deals additional damage to any fighters caught within the explosion's blast radius (scaling depending distance from point of impact, with any directly-struck fighter(s) taking the most damage). This Final Smash relies heavily on good positioning on Doomguy's behalf, as to ensure that the projectile can last long enough to deal the most damage (i.e. have it cover most of the stage's length as opposed to dumping it off the edge), while allowing the player to weigh between damaging multiple fighters longer and potentially killing all of them or directly striking an individual fighter for massive damage and a practically guaranteed kill. 4 variations of the DOOM: Eternal Praetor suit. All variants possess colour alterations emulating characters from Id Software's legacy titles. Yellow helmet with a white visor, purple-pink chest and shoulder plates, white arms and gauntlets, blue waist and leg armour with blue boots. Resembles Commander Keen from the series of the same name. Yellow and bronze helmet with light-flesh visor, bronze shoulder plates with flesh-coloured arms and brown gauntlets, a yellow chestplate, red leg armour and orange-red boots. Resembles the Ranger - the protagonist of the original Quake - as depicted in Quake Champions. 4 unique skins based off of Doomguy's previous in-game appearances. These skins will use modified versions of weapons from their equivalent games (or suitable replacements when a direct equivalent is unavailable), alongside unique pain/death sounds from their home games and unique head icons. Essentially all the armour variations for the Doom Slayer as seen in Quake Champions. "Unchained Predator": The Slayer in the Praetor Suit as seen in DOOM 2016. 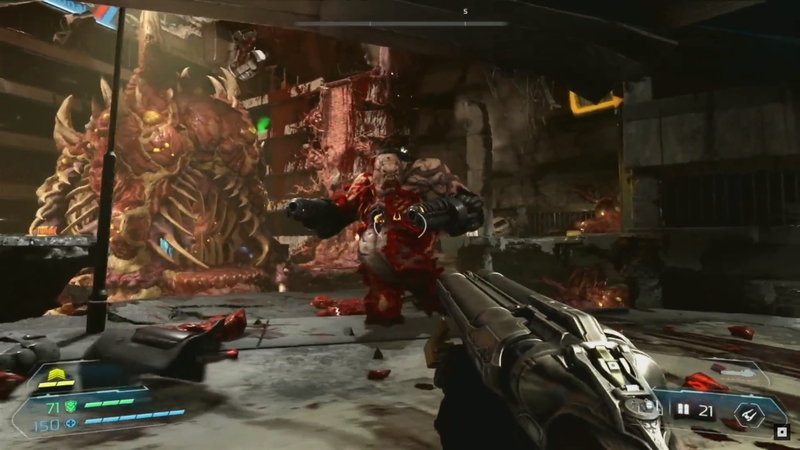 Utilises the DOOM 2016 incarnations of the Combat Shotgun, Plasma Gun, Super Shotgun, Chaingun, Rocket Launcher and BFG 9000, with the Heavy Cannon and Ballista being replaced by the Heavy Assault Rifle and Gauss Cannon respectively. "Doom Marine": The Marine Corporal who starred in Doom 3. Utilises the Doom 3 Shotgun, Plasma Gun, Super Shotgun, Chaingun, Rocket Launcher and BFG 9000, with the Heavy Cannon and Ballista being replaced by the Doom 3 Machine Gun and the Quake 4 Railgun respectively. Has a unique idle animation where he pulls out a flashlight and attempts to stick it somewhere on his currently-held weapon. "Arena": The same armour worn by Doom, the tough-as-nails Tier 6 fighter from Quake 3: Arena. Utilises the Quake 3: Arena Shotgun, Plasma Gun and Rocket Launcher, with weapon replacements including; the Quake 3: Arena Machine Gun (Heavy Assault Rifle), the Quake 2 Super Shotgun (Super Shotgun), the Quake 1 Super Nailgun (Chaingun), the Quake 3: Arena Railgun (Ballista) and the Quake 3: Arena BFG 10K (BG 9000). "Doomguy". The classic armour which started it all, worn by the unnamed Space Marine referred to only as Doomguy in Doom 1 and 2. Utilises the classic Doom versions of the Shotgun, Plasma Gun, Super Shotgun, Chaingun, Rocket Launcher and BFG 9000, with the Heavy Cannon and Ballista being replaced by the Zombieman Rifle and the Skulltag Railgun respectively. Additionally, Doomguy's face in all its pixelated, animated glory will sometimes replace his character portrait next to his damage meter in a match. Much like in classic Doom, his face acts as a convenient visual indicator for onscreen action. Becomes progressively beaten up as Doomguy takes damage, albeit with the blood cleaned up. Explodes in a shower of sparkles and blinks back into existence if Doomguy is KO'd (a kid-friendly version of the gib death animation). If KO'd in stamina mode, the face will use the "dead" sprite before following the above animation. Will glance to the left or right depending on the direction which damage was received. Displays an expression of shock and pain when launched. Grits his teeth while attacking, stopping only when no inputs are made. Grins maliciously when picking up a rare/powerful item. Or any firearm-type item for that matter. Eyes glow a golden colour when his Final Smash is ready to be executed. Character select pose: Facing backwards and looking over his right shoulder, his left hand raised above his head clenched into a fist and the Super Shotgun in his right hand, aimed in the direction he's looking at. Logo: UAC Logo (Classic or Modern), the DOOM logo (perhaps shortened to a D) or the Mark of the Slayer. Head icon: Simplified front view of his current skin's helmet. When using the "Doomguy" skin, the head icon becomes a simplified version of Doomguy's classic HUD face. Entrance: Teleports in through hellish energy then pumps the Combat Shotgun. Idle animation: Raises his arm to inspect the Doom Blade, extending then retracting it. Crumple animation: Falls forward while clutching his neck; a homage to the player death animation from Doom 1/2. Pulls out and activates the Slayer's Crucible, performing two threatening ground slashes before putting it away (could act as an edge-kill move like Luigi's kick taunt). Pulls out a Doomguy Doll, inspecting it before giving it a fist-bump. Fights off a horde of Imps swarming his position, with the shot freezing on Doomguy in the iconic Doom cover pose (aiming his Super Shotgun at an Imp grabbing his arm). Pulls out the Chaingun with the Mobile Turret modification and unleashes a continuous barrage. Crushes a demon skull with his foot, with the shot panning up to see Doomguy load the Super Shotgun and take aim at the camera, up close and personal (essentially the Doom Eternal teaser trailer from the Demon's point of view). No Contest/Defeat Pose: Slowly claps in a passive-aggressive manner. Samuel Hayden: That would be the Doom Slayer. I would advise you to vacate the area immediately unless you wish to suffer a messy demise. H: I am Samuel Hayden, Chairman of the Union Aerospace Corporation and the one responsible for the discovery of the Doom Marine. While our own research on him is limited at best, we do know that he has been fighting a rage-fuelled, one-man war against the forces of Hell for centuries. S: Not that it matters. Those inscriptions on the barrel don't provide any tactical advantage… though that large grappling-hook-blade attachment probably will. H: If you're still planning to engage the Doom Slayer (not that you have any chance of winning), I would advise you to engage him at long range and strike only when he lets his guard down; most of his arsenal is only effective from short to medium range, while his agility and lethality compensate for a surprisingly lacking durability. Now, if you'll excuse me, I have to attend to… dispelling rumours about a supposed "demon incursion". H: As I said; dispelling rumours. V: Funny you should mention that. He's had quite a few names over the years, though most people simply call him Doomguy. Pt: Doomguy? The berserker-packin' man and a half! A 12.0 on the 10.0 scale of badness! How did he even make it into Smash Bros.?! Palutena: Many consider him to be the king of the First Person Shooter. If anything, that would make him the perfect candidate as a representative of the genre. Pl: And every other fighter in this fighting tournament isn't violent to some degree? Pt: …Right. I'll be honest; I'm not feeling too confident about fighting him. V: *Gasp! * Is poor little Pit finally admitting defeat? Palutena might have to consider getting a new bodyguard captain. Pt: NO WAY! It's just that… those guns of his look like they could tear anything to pieces! And that heavy armour doesn't look like it weighs him down much. Pl: That's correct, Pit. The Doom Slayer's firearms all deal heavy amounts of damage, while his mobility allows him to keep the pressure up on opponents. V: While his weapons may be deadly, they all run off of a limited ammo supply. If he runs dry, he'll be unable to use his special attacks and be forced to use a weak pistol for his regular attacks. 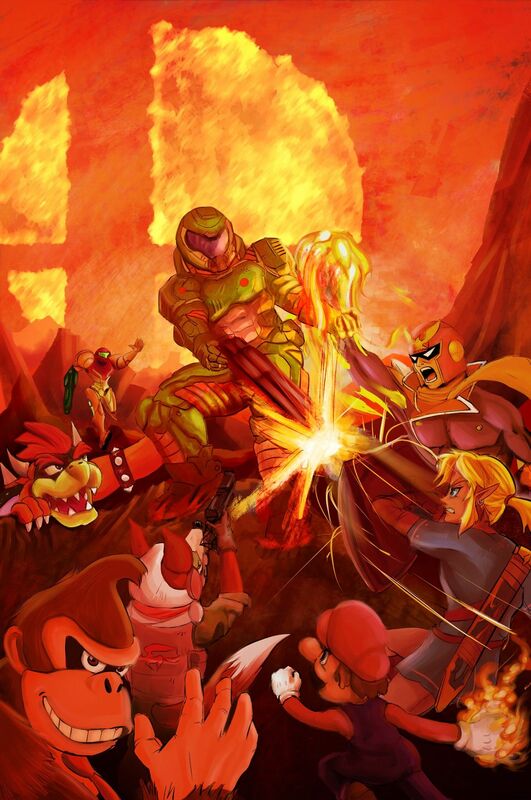 Character artwork: A recreation of either the Classic Doom cover art or Doom 2016 cover art (which is itself a recreation of the classic cover art) with various Smash fighters instead of demons (with Samus as the lone marine calling out at Doomguy in the classic cover's background). A stage taking place on Earth during the demon invasion. The backdrop is of a futuristic city in the midst of being dragged into hell, with dominating features including burning, ruined buildings, floating landmasses and skyscraper chunks suspended by large tentacles, a blasted terrain of rubble and large, flowing rivers/. Naturally, this backdrop would have to be scrubbed of its gore, blood and most satanic imagery in order to pass the PG-13 rating (if the latter warrants such censoring). The stage itself features a wide, flat arena with several stationary platforms and a mancannon in the centre. Additional elements such as hazardous Nukage pools, explosive barrels and small pillars are randomly placed at the start of the map. Zombieman (1): Weakest of the standard demons, uses a slow-firing Plasma gun against attackers. Imp (2): Throws fireballs and scratches when up close, but is easily killed. Hell Razer (2): Fires a long-range, penetrating laser. Also easily killed. Pinky (3): Charges down fighters. Weak, but takes greatly reduced damage from the front. Spectre (3): Identical to Pinkies, but are (mostly) invisible. Lost Soul (1): Makes a beeline towards fighters, dealing significant damage and slight knockback upon impact. Dies in one hit from most attacks. Hell Knight (5): Rushes in aggressively with punishing melee strikes. Slightly tough to take down. Mancubus (8): Shoots fireballs from a distant and has a flamethrower attack at close range. Tough, but slow at moving and aiming at fighters. Cyber-Mancubus (8): Identical to the Mancubus, but only fires green globs of acid which produce damaging, acidic puddles upon impact. Revenant (6): Glass cannons which fire high-damaging missiles in bursts and move quickly using their jetpack. Cacodemon (6): Slow, tough flyer which bombards the arena with projectiles. Pain Elemental (7): Continuously expels lost souls from its mouth, which circle the brown ball before being thrown at fighters. Arachnotron (7): Brains-on-stilts which fire high-damage plasma bolts from a mounted cannon. Baron of Hell (10): Significantly tougher Hell Knight which throws green fireballs between melee strikes. Summoner (10): Average toughness, but teleports frequently and summons lesser monsters (Imps, Hell Razers, Pinkies, Spectres, Lost Souls) to protect it. Cyberdemon (50): Attacks by firing rockets from its arm, alongside a high-damage, penetrating laser and showering the arena in rockets. Once brought down to half-health, his Argent Accumulator will disengage, sending the stage to Hell and granting the Cyberdemon the ability to create flaming slashes from his arm-spike and cordon off stage sections with rock walls, dividing up/trapping fighters. Disintegrates upon death. Spider Mastermind (50): Only takes damage from attacking its head, with bonus damage taken by hitting the face. Attacks include: fairing its rapid-fire plasma chaingun; sweeping multiple lasers across the lower and upper levels of the stage; throwing bombs across the stage; and firing a single, penetrating laser. May occasionally swipe at the stage and flip upside down, hiding most of its head. Once at half-health, gains additional attacks in the form of throwing pillars at fighters and electrifying the bottom floor, damaging anything standing on it. at 10% health, becomes heavily damaged and crippled, only attacking fighters with flailing lasers and throwing pillars. Sinks into the floor upon death. Haste: Greatly increases movement and attack speed. Invulnerability: Nullifies all damage received and knockback. Lasts for a shorter amount of time than other powerups and cannot protect against falling into the blast zone. Berserk: Greatly increases melee (punch/kick) damage and knockback. Quad Damage: Greatly increases weapon (sword/gun) damage and knockback. Mega Health: Resets damage counter to 0%. Armour/Mega Armour: Adds a layer of armour over a fighter, absorbing 100 damage until depleted. Mega Armour can absorb 200 damage. The Cyberdemon can appear from an Assist Trophy, on top of being a stage boss like Rathalos. He behaves much the same way in his boss appearance but is now standing directly on stage as opposed to in the background. AT!Cyberdemon also has reduced health compared to Boss!Cyberdemon, and has all attacks available from the get-go. For the most part, I tried going for tracks which had a fast pace/were good in action scenarios, to fit the fighting speed of Smash Bros. The song pool is relatively large for a newcomer, so treat this as more of a pool of tracks the devs can select from. With the possible exception of the 2016 and Eternal tracks, a lot of these tracks could also be given remixes by Japanese artists (this includes tracks I haven't included, so don't worry if I haven't listed one you personally felt could fit here). Bold tracks are personal faves. Also alternatively, Intermission from DOOM (https://www.youtube.com/watch?v=cixW6rogZ48&t=1792s) on a constant loop continuing until the results screen ceases to be displayed. The Doom Slayer - KO's from throws heal. The Doom Slayer (Unchained Predator Alt: Rocket Jump) - Reduced damage from explosions. UAC Field Drone - Powerups appear closer to fighs. The Cyberdemon - Increases damage after being KOd. Resets after scoring a KO. The Spider Mastermind - Increases projectile weapon damage. Demons - Increases damage of fire attacks. Dr Samuel Hayden - Increases damage of sword attacks. VEGA - Reduces damage from ice attacks. Doomguy Figurine - Reduces damage while shrunk. Powerups - Items attract themselves to fighters. The trailer begins in an arena made of a yellow-brown stone and adorned with various red, glowing runes, many of which bear a resemblance to demonic iconography. The arena itself sits upon one of many floating islands hanging over a void of orange clouds and possesses a long, bridge-like path leading to a tall fortress adorned with a goatlike skull. Pit, Dark Pit and Palutena are locked in an intense scrap with Spirit-clones of Bowser, Ridley and Bayonetta in the hellish arena, the latter trio quickly gaining the upper hand before defeating the Light Goddess and her angelic compatriots. Spirit-Bayonetta and her demonlike allies look down upon the battered heroes, the Witch clone motioning to allies to restrain them as Palutena weakly states "We'll never become soulless husks like you", to which Bayonetta ignores. The fighters are suddenly interrupted by a distant screech, as the doors of the demonic fortress are raised and waves of creatures begin pouring out. The creatures are of varying sizes and appearances: scrawny, implike humanoids; flying creatures resembling gargoyles; pink-coloured armoured beasts; muscular humanoids with smooth, skull-like heads; enormous, bipedal monsters possessing crimson skin, cloven hooves and goat horns; and floating, cyclopean spheres of red and brown. The monsters make a beeline towards the arena, the grounded creatures scrambling over and pushing each other out of the way as they cross the bridge, with several of them falling into the abyss below. The possessed Witch and her reptilian allies ready themselves for the oncoming horde... only for the creatures to part and avoid the fighters, running either side of them and jumping to other nearby islands; almost as if they were running away from something. Bowser and Ridley look at each other with confused expressions and look to Bayonetta, who is looking towards the fortress gate with a steely gaze. The two dragons look towards the gate, only to be shocked by what they see. Music begins to set in as the trailer cuts to fortress from the fighters' perspective, where the silhouette of a bulky humanoid is seen standing amidst the orange glow from the open doorway. Cut to the first-person perspective of a familiar Heads-Up Display, which begins to scan the 6 fighters. Cut to various close-up views of the mysterious newcomer, with the shots quickly cutting between a heavy green chest plate; a studded left gauntlet with a retracted blade, which pans up to reveal a shoulder-mounted cannon; and an exposed right bicep, which pans down the arm to show a double-barrelled shotgun - decorated with various inscriptions and a two-pronged blade attached to the underside - being held in the hand. Cut back to the HUD, which has identified the Angel Land protectors as "Safe" and the latter victors as " RIP AND TEAR". Cut to a shot of the newcomer's head or rather, helmet, where subtle facial figures can be seen through the visor. The shot pans backwards away from the head, revealing a massive, imposing figure in a green carapace-like armour reloading his shotgun, with the barrels being snapped into place as the music drops into the iconic riff from At DOOM's Gate. THE DOOM SLAYER RIPS AND TEARS INTO BATTLE! The Doom Slayer then charges his three victims at a full sprint, which they respond to by firing off pistol volleys and fireballs at his direction. The Slayer suddenly pulls out a black and red-accented Rocket Launcher, which he then fires at his feet to send him flying high above his victims. He re-equips the Super Shotgun in mid-air, before landing between the two groups and taking aim at his victims. The music finishes as the trailer cuts to the Smash logo, right as the Slayer pulls the trigger. I hope I didn't make any of the characters too underpowered/OOC. Feel free to provide feedback + critique. I support Doomguy for Super Smash Bros. Ultimate. Something i would love, is that his design from the classic Doom games were his default costume and either his design from Doom 64 or Doom 2016/Eternal was included as an alt. Looks a lot like my Duke Nukem moveset I made a while back although mine had weapon-switching via taunts. And I do like the idea of the Chainsaw being named the Great Communicator for the laughs. I'd also like to see the BFG shoot the "Christmas lights" from the beta but that probably won't happen. I do like how you went way more in depth than usual with the newcomer threads. While I'm not against this, I love both looks, but my gut feeling is his default look would be smashified Doom Eternal Slayer, especially if they include his new, Doom Eternal based features like the grappling SSG and the armblade/shoulder launcher in his moveset. Then they would make a version of the classic armor with those additions as the main alternate look. Who knows though, anything could happen. I feel he would, and should, have those new D:E features though, so I do think that would make the DS from D:E as the default look likely. We shall see. That’s trippin. Clearly he should look like Karl Urban, or Dwayne Johnson saying “I’ve got one round”! But yeah, rebooted Doomslayer is too iconic not to use now. Why thanks! Attention to detail is something I always take pride in. Tried to find a balance between the insane brutality and lighthearted Easter Eggs and references that characterises Doom. I think for a future revision, I might divide the Palutena's guidance into 2: One for his four Eternal+2016 armour variants, which see the trio discussing his more modern elements (took out a Titan unarmoured and without guns, fought Hell for centuries), and one for his classic set which is basically "Memes, Doom Comic references and other nonsensicalities"
Viridi: Y'know, despite being a human, I think this Doomguy would make a perfect fit as a member of the Forces of Nature. Pit: You serious? This is probably the first and only time I'll ever hear you say anything nice about a human! V: Well, we do share similar views about nuclear waste. Why can't we find a way to safely dispose of it and protect the environment? What kind of planet will we be leaving to our children? And our children's children. And... Oh, the humanity! Pt: As much as I don't want to rain on your parade, I think he's more of a "lone wolf" kind of guy. V: And what makes you think he wouldn't want to work for me? Palutena: Well, he probably wouldn't take kindly to that grudge you hold against his species. He'd probably do to you the same thing he did to his previous superior officer when he gave orders to fire on civilians. I wouldn't mind seeing that Duke Nukem moveset if you still have it. Oh, and feedback is greatly appreciated. I wouldn't mind seeing that Duke Nukem moveset if you still have it. Unfortunately, it's lost and I don't remember what I made it for. If it helps, he used the Shotgun, Pistol, and Ripper for his A moves, the Flamethrower from Duke Nukem 2 was his Up B, and two of his B moves were different depending what weapon he had (the Freezethrower and Devastator were two of the ones I remembered). I think his Final Smash was the super electric gun from Manhattan Project. Damn. Even that small snippet is sounding awesome. You know, seeing how the new Classic Mode is unique to each character, maybe Doom Slayer’s Classic Mode will be about fighting demon-like Smash opponents. Giga bowser could be used as a reference to the cyber demon, or would meta ridley better fit that bill? Probably Meta Ridley just on account of having cybernetics. Cyberdemon I always did kinda consider the Ridley kind of rival of the series anyway, while Spider Mastermind was like the Mother Brain equivalent. 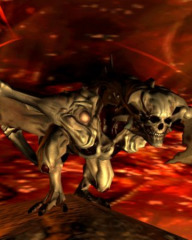 lol Shame this winged demon boss from the Doom 3 era didn’t become a staple too though, whom I brought up before. But yeah, Cyberdemon as a boss would be most ideal, though again, would settle for assist trophy too. In terms of Doom Slayer vs Doomguy as the default look, there’s a good chance Sakurai would go with the original since that’s the game he probably thought about when referencing John Carmack. Plus the Marine’s face is also iconic, and that’s not something present in Doomslayer’s design. I hope both designs are in as alts, but I’d really hope they go with Classic Doomguy. I dunno. The latest version has all these nifty tools that could be used in the moveset (the arm-blade and shoulder cannon). Yeah, that would be a wasted opportunity not to take advantage of for a moveset, though I’d still be happy with a Doomguy being in either way, even if it’s not the version I’d prefer. Stamina match against multiple weak Marios who attack by constantly throwing fireballs and punching the Slayer when he's close. References the classic Imps. Stamina match against multiple average-health Warios (Pink+Blue alt) only using Chomp. Halfway through the fight, Warios begin to use the Wario Bike in addition to the Chomp. While on the bike, the Warios won't attempt to change direction unless after hitting a solid wall and take reduced damage from frontal attacks. References the classic and modern interpretations of the Pinky Demons. Stamina match against two giant Luigis constantly throwing fireballs. References the Barons of Hell, specifically the fight against the twin Barons in E1M8 (Phobos Anomaly), the last level from Doom 1's first episode, Knee Deep in the Dead. Bonus points if Sign of Evil is used for this fight. Stamina match against a giant Charizard, which has indefinite flight and can only attack with Fireball Cannon (if custom specials are retained in Ultimate) and Flare Blitz. Timers will periodically spawn over the course of the battle, of which only the Doom Slayer can use. References the fight against the Maledict (the final boss of Doom 3: Resurrection of Evil), with the Timers replicating the time-slowing properties of The Artifact/Heart of Hell. Bonus point if the Doom 3 Theme is used for this fight. Stamina Match against the Slayer with the "Ranger" alt: Moves around primarily by rocket-jumping around the stage, attacking with Shotgun, Super Shotgun. Quad Damage powerup spawns near "Ranger" occasionally throughout the match. Bonus points if Descent into Cerberon is used for this fight. Stamina Match against the Slayer with the "Blazkowics" alt: Increased weight and decreased speed; primarily attacks with the Chaingun, Heavy Cannon and Pistol (carries no Shotgun/Plasma). Chicken drumsticks regularly spawn near "BJ" throughout the match. Bonus points if Evil Incarnate is used for this fight. Stamina Boss Fight against the Cyberdemon boss. Bonus points if Cyberdemon is used for this fight. Stamina Match against the Jeanne-alt Bayonetta, who attacks primarily through Bullet Arts. Once defeated, the Spider Mastermind boss is summoned. Once it's health runs low, a Smash Ball is spawned and the Mastermind won't take any damage from attacks besides a Final Smash. References Olivia Pierce, her transformation into the Spider Mastermind and the subsequent boss fight. Bonus points if Mastermind is used for the fight. Maybe his Classic Mode title could be called "RIP AND TEAR"? Hmm... you might be onto something. Dang! That looks awesome! Props to you, man! So, I was rewatching DOOM Eternal gameplay (as I normally do) when I got to the part where the Doomslayer starts climbing up the wall. That got me thinking, and now I have the simple question. Since he can do that in Eternal, would that mean Doomslayer would be able to wall cling/wall jump in Ultimate? Personally I would like to see his 2016 look since it's fresh and new but still focuses on the fundamentals of the characters aka many gun. Obviously I'm fine with any choice though and any skin as an alt. If he got in, they would use the Eternal design. Eternal is the up coming game that will be on Switch. It would be strange to use an older design when the new one is this recent. Plus the Eternal design is a nice balance between his 2016 and classic designs, with the exposed arms and light colored belly. The Intermission theme. Would you all prefer if it was Doomguy’s victory jingle? It would be a looping theme like Cloud’s victory jingle. Or would you want the intermission theme to be a song on a Doom stage?